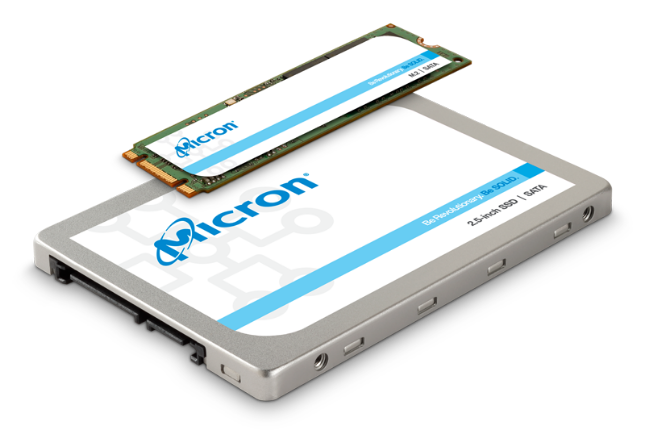 If you are looking to upgrade your existing solid state drive or hard disk drive, Micron has a new product that may interest you. The "1300," as it is called, uses the "slower" SATA interface, meaning it isn't as fast as the fancy new NVMe options on the market. If your computer doesn't have an NVMe M.2 slot anyway, that is sort of a moot point. With the SATA interface, speeds are still respectable -- 530 MB/s read and 520 MB/s write. Those speeds are regardless of capacity. If you go with the 2.5-inch form factor, you can choose among 256GB, 512GB, 1TB, and 2TB. The M.2 variant has the same capacities as the other, minus 2TB. "The Micron 1300 SSD makes flash storage accessible to more users, enabling its adoption in a broader set of personal computing devices for a better mobile computing experience. Consumers who are eager to move from rotating media to solid state drives value fast performance, quick startup, and reliability — whether for desktop, mobile or workstation PCs. SSDs address these needs better than power-hungry hard disk drives (HDDs), yet their higher prices have kept users from shifting to SSDs. 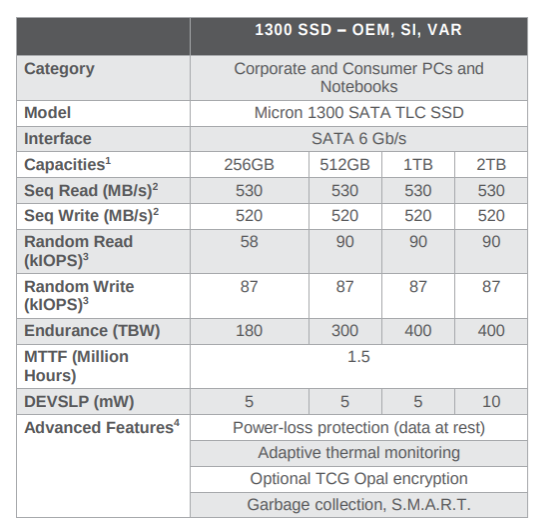 Micron redesigned the 1300 SSD series to close the price gap," says Micron. The company further says, "The new Micron 1300 SATA SSD is one of the industry’s first 96-layer triple-level cell (TLC) 3D NAND-based SSDs, available in capacities up to 1TB (in M.2) and 2TB (in 2.5-inch). This product introduction extends Micron’s leadership in high-density SSD design and high-volume manufacturing of performance 3D NAND-based flash drives. The ability to build drives with very small footprints like the M.2 SSD form factor, which is as small as a stick of gum, also hinges on Micron’s leadership in 3D NAND technology." While Micron promises the 1300 SATA SSD will be affordable, it doesn't actually share pricing. The company also fails to reveal availability. With that said, we should hopefully know more soon. In the interim, you can check out the specifications above.